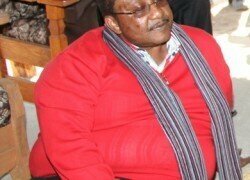 DEFENCE Minister Geoffrey Bwalya Mwamba has refused to be drawn into a debate with his party’s junior cadres. Mwamba says that he cannot respond to accusations by PF Lusaka Province youth chairman Kennedy Kamba that the defence minister accosted him. In an interview with the Daily Nation at Harry Mwanga International Airport in Livingstone on Thursday while waiting for President Michael Sata’s arrival, the defence minister said he would not engage in an argument with Kennedy Kamba because the former was too junior. Mwamba instead said that only Post Newspapers boss Fred M’membe was in a position to answer questions concerning Kamba. “Yes my dear brother, what can I do for you?” GBM asked the Daily Nation journalist who wanted to get a comment on the accusation made by Kamba. “Now Kennedy is too junior for me to start commenting on his story and which media did that story come out from?” GBM asked. “I think go and ask Fred M’membe; he has answers to that question,” the defence minister responded as he walked towards the red carpet where all Cabinet ministers were standing while waiting for President Sata’s arrival. And Kennedy Kamba was also seen at the airport in the company of PF Mufumbwe MP Steven Masumba. Meanwhile, President Michael Sata yesterday shocked Cabinet ministers, party officials and cadres by not addressing the crowd which was at the airport to receive him.